All of the Joshi wrestlers above have profiles on Joshi City, you can click on their name to go straight to it. As this aired on Nico Pro, the show is unclipped. For better or worse. With wrestler produced shows, you always will get some oddball matches, and this event doesn’t waste any time getting there. ASUKA is a transgender wrestler from Pro Wrestling WAVE, while her partner Tsukasa Fujimoto is one of the top wrestlers in Ice Ribbon. On the other team, Ryo Mizunami is a one of the top wrestlers from WAVE while Megumi Yabushita is a veteran Freelancer. Anything can happen in matches like these, it is anyone’s game. Ryo and Tsukasa start things off, they trade wristlocks until Ryo pounds Tsukasa to the mat. Hard shoulderblock by Ryo but Tsukasa comes back with a dropkick, scoop slam by Ryo but Tsukasa bridges out of the cover and hits a dropkick. Jumping elbow by Ryo in the corner, Megumi comes over and holds Tsukasa so that Ryo can hit a lariat. Ryo tags in Megumi, Megumi has a belt with her and hits Tsukasa repeatedly with it. Megumi chokes Tsukasa with it, scoop slam by Megumi and she covers Tsukasa for two. Megumi applies a leg submission and then a chinlock, but Tsukasa gets to the ropes for the break. Megumi picks up Tsukasa and hits a scoop slam, double kneedrop by Megumi and she applies a crab hold. ASUKA breaks it up, Megumi picks up Tsukasa but Tsukasa hits a hurricanrana for two. Tsukasa tags in ASUKA, ASUKA boots Megumi repeatedly in the head before throwing her in the corner. ASUKA moonsaults over Megumi and dropkicks her, Space Rolling Elbow by ASUKA and she dropkicks Megumi in the head for a two count. Megumi quickly applies a cross armbreaker takedown but ASUKA gets a foot on the ropes, ASUKA goes off the ropes and hits a rebound crossbody for two. ASUKA tags in Tsukasa, Tsukasa kicks Megumi in the back but Megumi ducks the PK. Twisting bodypress by Tsukasa but Megumi puts her in a submission, Tsukasa wiggles to the ropes and manages to force the break. Tsukasa throws Megumi in the corner but Megumi applies a hanging armbar, Megumi goes up top and hits a missile dropkick to Tsukasa’s arm. Tsukasa fires back with a dropkick but Ryo hits her from the apron and Megumi drops her with a judo throw. She tags in Ryo, spear by Ryo to Tsukasa but Tsukasa blocks the uranage. German suplex by Ryo and she hits a legdrop for a two count. Ryo goes off the ropes but ASUKA dives off the top turnbuckle with a crossbody, double Irish whip to Ryo and ASUKA dropkicks her. Tsukasa dropkicks Ryo too, she goes up top and hits a missile dropkick for a two count cover. Tsukasa picks up Ryo but Ryo gets Tsukasa on her shoulders, Tsukasa flips off and rolls Megumi to the mat before hitting a PK. She tags in ASUKA, ASUKA goes up top and delivers a missile dropkick for two. Fireman’s carry takeover by ASUKA and she goes for Megumi’s arm, Megumi gets back up and hits a series of elbows. ASUKA charges Ryo but Ryo hits an overhead belly to belly, lariat by Ryo and she nails a uranage for a two count. Ryo drags up ASUKA but ASUKA blocks the full nelson, hard lariat by Ryo but ASUKA kicks out of the cover. Megumi comes in but ASUKA knocks them both down with a springboard moonsault, Tsukasa comes in and they both kick Ryo in the head. Gutwrench suplex by ASUKA, and she covers Ryo for two. Chokeslam by ASUKA, but Megumi breaks up the cover. ASUKA goes up top but Ryo rolls out of the way of the moonsault, superkick by ASUKA but Ryo knocks her down with a lariat. Megumi hits a German suplex onto Tsukasa while Ryo hits a lariat onto ASUKA, but ASUKA kicks out of the cover. Ryo picks up ASUKA and nails the Hot Limit, and she picks up the three count! Ryo Mizunami and Megumi Yabushita get the win. This is not a ‘time release’ battle royal, so all wrestlers are in the ring to start the match. What an odd collection of wrestlers we have here. We have comedy wrestlers (Gabai-jichan and Kyusei Ninja Ranmaru), legends (Mariko Yoshida and Mima Shimoda), and current stars (KAORU, Hiroyo Matsumoto, and Mochi Miyagi). And we have Yamada Man Pondo, for whatever reason. Battle Royals are not taken nearly as seriously in Japan as they are in the United States, so this is just fun filler more than anything else. Yoshida targets Hiroyo right off the bat, but all the wrestlers end up in a giant headscissors chain, Gabai-jichan strolls in the ring and tries to roll them into a crab hold but he is too old and weak to do so. Miyagi does it instead but they roll into the ropes, Pondo and Ranmaru go after Miyagi but Miyagi rolls under then and poses. Pondo hits Ranmaru with a Stop Sign and poses as well, but Miyagi whips him and with everyone else covers Pondo for the three count! Yamada Man Pondo is eliminated. Ranmaru immediately schoolboys Miyagi, everyone else joins in and she is held down for three! Mochi Miyagi is eliminated. KAORU gets her board and starts hitting people with it, she tries to drop it onto Shimoda but Shimoda moves out of the way. 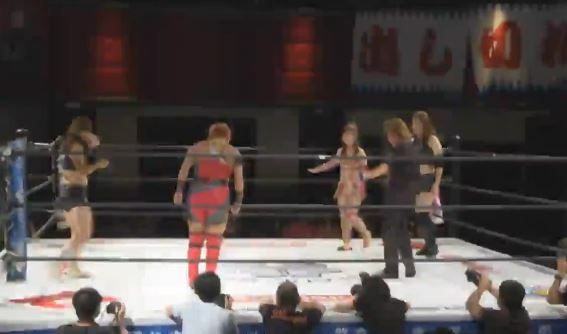 KAORU tries to to the same with Yoshida with the same result, Hiroyo is up next but she also rolls out of the way. They hold down Ranmaru and KAORU drops it on her (or slightly misses, the camera couldn’t really see it), Gabai-jichan comes in but he tosses his cane to KAORU which makes her act old herself. She tosses it to Hiroyo, Shimoda gets the cane next and Gabai-jichan knocks over both KAORU and Shimoda. KAORU and Shimoda are covered by the other participants, and both are counted down for three! Mima Shimoda and KAORU are eliminated. Hiroyo and Yoshida target Ranmaru but she avoids their attack, Gabai-jichan pushes Hiroyo over but everyone attacks him. Gabai-jichan schoolboys Ranmaru, and he gets the three count! Kyusei Ninja Ranmaru is eliminated! Gabai-jichan pokes Hiroyo with his cane, Yoshida tries to boot Gabai-jichan but Gabai-jichan moves and she kicks Hiroyo by accident. Hiroyo snaps Gabai-jichan’s cane and throws it to the mat, Irish whip to Gabai-jichan but he speeds up and lariats both of them. Vertical suplex by Gabai-jichan to Hiroyo, he goes to Yoshida but he hurts his back going for a powerbomb. Yoshida holds Gabai-jichan but Hiroyo lariats her by accident, Gabai-jichan slams Hiroyo on top of Yoshida and covers her for the three count pinfall! Mariko Yoshida is eliminated. Just Gabai-jichan and Hiroyo are left now, lariat by Gabai-jichan to Hiroyo and she goes for a powerbomb but Hiroyo lands on hop of him for the three count! Hiroyo Matsumoto wins the Battle Royal! As I mentioned above, Battle Royals in Japan are generally more humorous affairs. A few funny moments but overall not a whole lot to it, even if it is always nice to see Mariko Yoshida. More wrestling-produced show weirdness. Kyoko Inoue and Kaoru Ito are both legends from the heyday of Joshi, currently they are wrestlers for World Woman Pro-Wrestling Diana. They are 48 and 45 years old respectively, but still are rather active on the Joshi scene. On the other side are two male wrestlers, Shiryu is a Freelancer that regularly wrestles in GUTS World while Hagane Shinnou (formally Madoka) is a Freelancer that wrestles in a variety of promotions, including DDT and Dove Pro. So basically it is two of the more accomplished wrestlers in Joshi history against two low level Indie wrestlers. Inoue and Shiryu start the match and tie-up, Inoue pushes Shiryu into the ropes and she gives a clean break. They lock knuckles, Shiryu goes off the ropes but Inoue hits a hard shoulderblock. Shiryu stomps on Inoue’s foot and tags in Shinnou, kicks to the chest by Madoka but Inoue pushes him into the corner. Inoue tags in Ito, lariat by Ito in the corner but Shinnou dropkicks her back. Ito doesn’t go down, Shinnou goes for a suplex but Ito reverses it into a suplex of her own. Shinnou tries to lariat Ito but fails, and Ito gives Shinnou a hard lariat instead. Ito puts Shinnou in a crab hold, but Shinnou gets into the ropes for a break. Ito stomps down on Shinnou’s back before tagging in Inoue, Ito stays in and they both suplex Shinnou. Inoue tosses Shinnou by his head and hits a vertical suplex, elbow drop by Inoue and she tags Ito back in. Camel Clutch by Ito but Shiryu breaks it up, Ito picks up Shinnou but Shinnou flips out to the apron and hits a swandive dropkick. This gives him time to tag in Shiryu, Shiryu throws Ito into the corner and hits a running elbow followed by a pair of kicks and a diving thrust kick for a two count cover. Ito knocks down Shiryu with a lariat and hits a footstomp, running splash by Ito and she covers Shiryu for two. Ito picks up Shiryu but Shiryu elbows her off, he goes off the ropes but Ito catches him with an uranage. Ito tags in Inoue, elbow by Inoue but Shiryu chops her back and they trade blows. Drop toehold by Shiryu and he goes for a Tiger Feint Kick, but Inoue catches him and drops Shiryu to the mat. Lariat by Inoue, and she covers Shiryu for a two count. 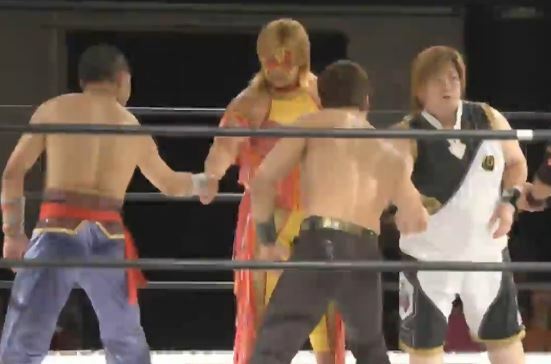 Ito comes in to help but both she and Inoue run into each other by accident, dropkick dropkick to Inoue and Ito but Inoue hits a lariat on both Shiryu and Shinnou. They call out of the ring, Inoue goes out after them while Ito goes for a baseball slide, but she kicks Inoue by mistake. Shiryu gets in the ring and catapults off the referee and delivers a diving kick to Ito’s face. Inoue is slid back in and double teamed, cover by Shiryu but Ito breaks it up. Shiryu goes up top but Ito hits him before he can jump off, Inoue joins Shiryu and delivers a superplex. Diving footstomp by Ito, cover by Inoue but Shinnou breaks up the cover. Inoue picks up Shiryu and nails the Niagara Driver, cover by Inoue and she gets the three count! Kyoko Inoue and Kaoru Ito are the winners. This is a Street Fight. Another Intergender match so if you aren’t into that type of thing, this probably isn’t the show for you. Chikayo is a veteran Freelancer, these days she wrestles primarily in Marvelous and Diana with an occasional stop in Sendai Girls’. KAZUKI is a wrestler from PURE-J, she is a 20 year vet but hasn’t won a title since 2010. 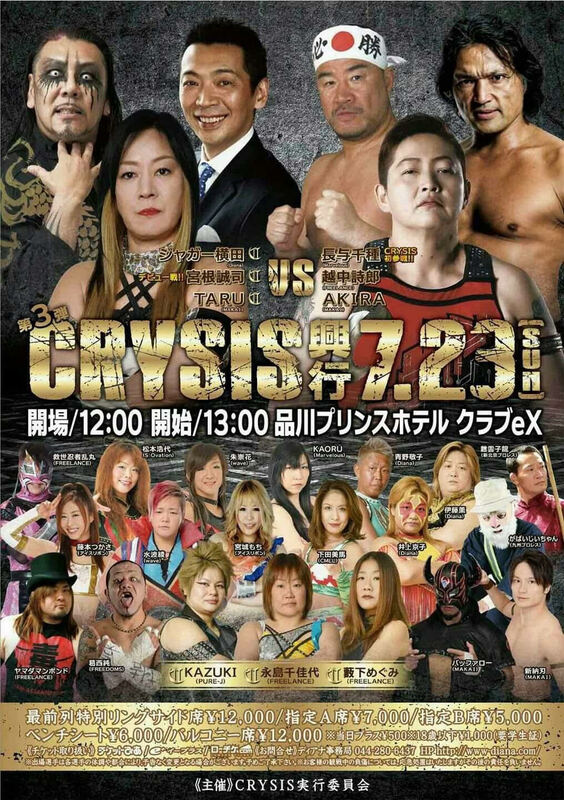 On the other side, Jun Kasai is a popular wrestler from FREEDOMS who is best known for his work in Big Japan Pro Wrestling, while Buffalo is a Freelancer best known for his many years in Osaka Pro. Since this is a Street Fight, it will be even crazier than usual, although even if it wasn’t officially one it would have turned into a Street Fight anyway with this wrestler combination. Chikayo and KAZUKI attack before the match starts with chairs, Buffalo is isolated in the ring and double teamed with chair shots. KAZUKI puts a bucket over Buffalo’s head and kicks it, Kasai comes in the ring and trades strikes with Chikayo. KAZUKI attacks Kasai from behind with a chain but Kasai headbutts her, and the action spills out of the ring. Buffalo and Kasai take over on the floor, KAZUKI is put on a table while Kasai goes up to the top turnbuckle and hits a diving splash onto KAZUKI. Kasai gets a barbed wire bat and pushes it into Chikayo’s head, Buffalo rolls Chikayo back into the ring and hits her with a back elbow. Buffalo stomps Chikayo and elbows her into the corner, running elbow by Buffalo and he tags in Kasai. Big boot by Kasai and he slices Chikayo’s face with… a board of some sort, leg drop by Buffalo from the apron and he kicks Chikayo in the head. Cover by Kasai, but it gets a two count. Kasai picks up Chikayo and bites her head, piledriver by Kasai and he covers Chikayo for two. Kasai brings a ladder into the ring but Chikayo kicks him low and hits both Kasai and Buffalo with the metal bucket. Chikayo goes up top and hits a diving footstomp to Kasai’s groin, KAZUKI hits Kasai repeatedly with a chain before hanging him over the top rope with it. KAZUKI pulls Kasai back into the ring and hits a couple reverse double kneedrops for a two count. KAZUKI brings the ladder to the middle of the ring but Kasai suplexes her on it, he tags in Buffalo but KAZUKI drops him with a Codebreaker. Chikayo comes in but Buffalo lariats both of them, he puts the ladder on his neck and helicopters it into both opponents. Buffalo tries to push Chikayo with the ladder but KAZUKI helps push Buffalo into the corner, kicks by Chikayo and she hits Buffalo with a chair. KAZUKI goes up top and slams the ladder down onto Buffalo, then Chikayo goes up to the top turnbuckle and hits a diving footstomp onto Buffalo and the pile of chairs/ladder. Chikayo grabs Buffalo but Buffalo kicks her in the stomach, Buffalo throws the ladder at Chikayo and makes the tag to Kasai. Kasai lariats Chikayo in the back of the head, another lariat by Kasai but KAZUKI breaks up the cover. Kasai picks up Chikayo and hits a scoop slam, he sets up the ladder and climbs it, but Chikayo joins him and spits red mist into his face. Kasai falls to the mat and Chikayo dives off the ladder with a footstomp. Cover, but Buffalo breaks it up. Fisherman Buster by Chikayo to Kasai, but Kasai kicks out. Chikayo gets a chair but Kasai blocks it and hits Chikayo with the chair instead. Kasai runs off the ropes repeatedly and hits a lariat, but the cover gets two. Kasai picks up Chikayo and delivers the double underhook facebuster, he scoop slams Chikayo in front of the ladder before climbing up and nailing the Pearl Harbor Splash. Cover by Kasai, and he gets the three count! Jun Kasai and Buffalo are the winners. Time for the main event! Most of these wrestlers are well known by wrestling fans. Chigusa Nagayo and Jaguar Yokota are two of the top wrestlers in Joshi history, and are now mainly promoters and trainers. AKIRA, Shiro Koshinaka, and TARU are veteran male wrestlers that are Freelancers in a variety of smaller promotions. This is Seiji Miyane’s wrestling debut, I don’t know a whole lot about him but he seems to be training under Jaguar Yokota. An odd place to have a wrestler debut, but its Jaguar Yokota’s show and she is going to do whatever she wants. Yokota and Nagayo start the match, Nagayo pushes Yokota against the ropes and she gives a clean break. Irish whip by Nagayo but Yokota ducks the heel kick, scoop slam by Yokota and she covers Nagayo for two. They tag out as TARU and Koshinaka come in, TARU tries to shoulderblock Koshinaka over but Koshinaka delivers a hip attack. Chinlock by Koshinaka but TARU kicks him in the stomach and both wrestlers tag out as AKIRA and Miyane become the legal wrestlers. AKIRA and Miyane trade holds, they end up on the mat but Miyane gets away from AKIRA and they face off again. AKIRA goes for a suplex but Miyane blocks it and hits a vertical suplex of his own, Octopus Hold by Miyane but Nagayo breaks it up. 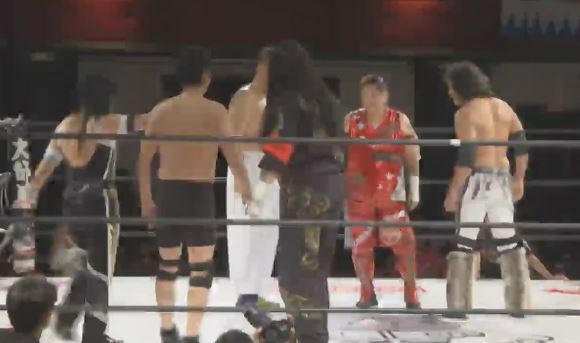 AKIRA tags in Koshinaka, hip attacks by Koshinaka to Miyane and he tags in Nagayo. Chops by Nagayo, Miyane returns fire but Nagayo chops him to the mat and kicks him against the ropes. Nagayo tags AKIRA but TARU comes in to help Miyane, they both suplex AKIRA before Miyane makes the tag to Yokota. Nagayo tags in too but TARU hits Nagayo from the apron, Yokota hits Nagayo in the stomach with a rod before choking her with it. TARU stays in as the legal wrestler and starts on Nagayo’s arm, he takes Nagayo out of the ring and tosses her around in the crowd. Back in the ring, kicks by TARU to Nagayo but Nagayo fights back and the two trade shots. TARU tags in Yokota, Miyane comes in too and they triple team Nagayo in the corner. Kicks by TARU but Nagayo catches him with a backdrop suplex and tags in Koshinaka. Hip attack by TARU, Yokota and Miyane come in but they get hip attacks as well. Koshinaka goes up top and hits a diving hip attack onto TARU, cover by Koshinaka but TARU kicks out. Koshinaka tags AKIRA, AKIRA goes up top and hits a diving body press, but Miyane breaks up the cover. AKIRA goes off the ropes but TARU catches him with a chokebomb and tags in Yokota, AKIRA kicks Yokota however and tags in Nagayo. Nagayo grabs Yokota and hits a vertical suplex, waistlock by Nagayo but Yokota gets out of it with a roll-up for two. Nagayo tosses Yokota into the corner but Yokota catches her coming in and kicks her in the head. Nagayo pulls Yokota back to the middle of the ring and puts her in the Scorpion Deathlock, but TARU quickly breaks it up. Nagayo catches Yokota with a sidewalk slam, but TARU breaks up the cover. TARU and Yokota both suplex Nagayo, Miyane goes up top and hits Nagayo with a diving crossbody for a two count. Yokota then goes up top but Nagayo avoids her somersault senton, Koshinaka and AKIRA both come in and clear the ring so that just Nagayo and Miyane are left. Backdrop suplex by Nagayo to Miyane and she drops him with a snap piledriver, but Miyane gets a shoulder up. Scorpion Deathlock by Nagayo, and Miyane has no choice but to submit! Chigusa Nagayo, AKIRA, and Shiro Koshinaka win! Unlike the other matches on this show with long-time veterans, this one was a bit too slow for my liking. 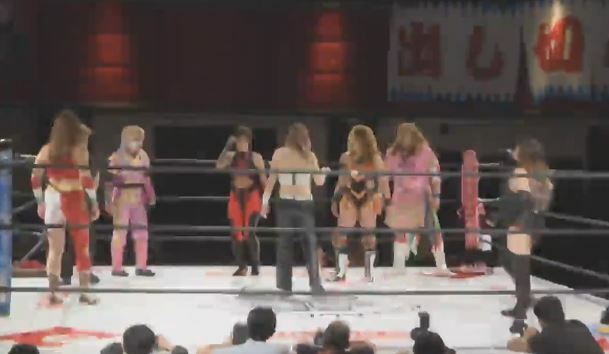 It was just really by the numbers, the match was almost 20 minutes and the only interesting parts were when Chigusa Nagayo and Jaguar Yokota squared off. I am not sure of Miyane’s backstory but (obviously) he isn’t very good yet and negatively impacted the match during several of his segments. Its always a pleasure to see veteran wrestlers like Shiro Koshinaka or AKIRA, but the match was just a bit too long and listless. This would have worked better in the midcard, but as the main event it was a bit disappointing. Wrestler produced events are always weird and random – this show was no exception. Most of it was entertaining, I really liked the two midcard tag matches quite a bit and the parts of the main event with Yokota and Nagayo were well done. The Battle Royal didn’t do a lot for me and main event didn’t have the excitement that one would hope for, but top to bottom I still enjoyed the show as its so different from the norm. If you have some free time and want to see some unique match-ups, you could do far worse than watching this show.